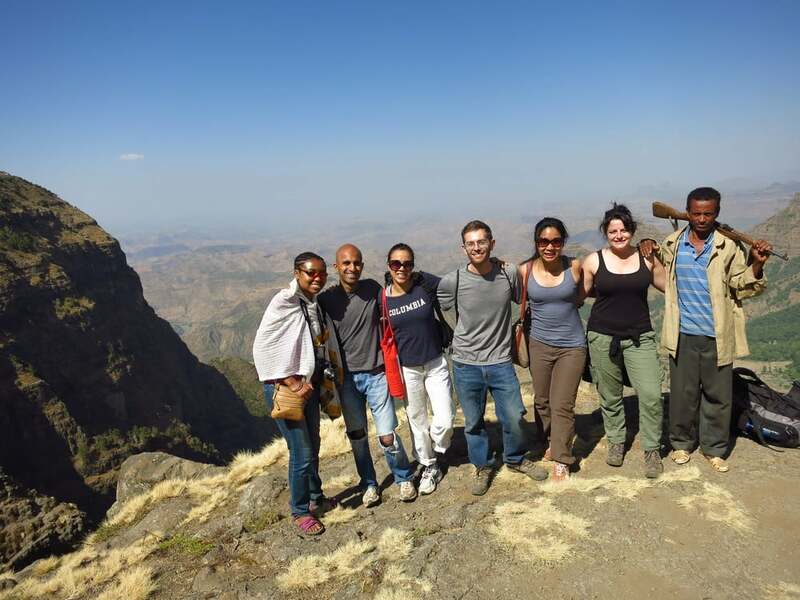 One of the top attractions in Northern Ethiopia is Simien Mountain. 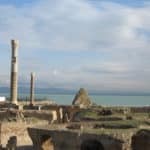 Given that we were traveling in a group, we organized a private tour. Bus departed from Gondar. Two hours later, we arrive at the bottom of the mountain. Apparently, we needed not only a guide, but also a guard who came with a rifle. 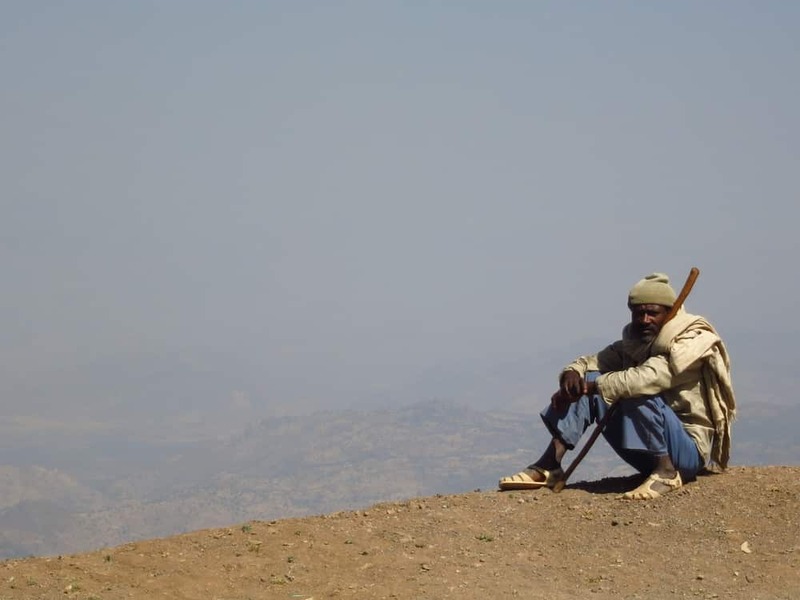 Supposedly there used to be quite a few bandits in the mountain, but that situation has been rectified, and now, the practice of having a guard is still in place to provide local employment. I must say, I felt safer with him around. You never know what animal, or er, bandits, are roaming around. We set off on a short trek. Compare to my hike in Sichuan, China a few months ago, this was a breeze walk in the park. The view was nevertheless stunning. As we were on top of the mountain, we ran into a group of few girls. Turns out one of them was the Peace Corps Volunteer who had given us restaurant suggestions in Gondar from the previous night. 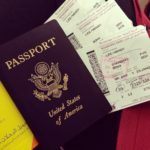 Ah, the life of Peace Corps! At some point during our trek, we saw baskets and crafts, along with a group of children and women. Supposedly, the products were for sale, and were made by the children. It’s probably a bit of a touristy trap, but I bought one nevertheless. 3 USD is pocket change to me, but is much more to the kids. The guidebook indicated that animals could be spotted during the trek. I anticipated an odd monkey or two along the way. 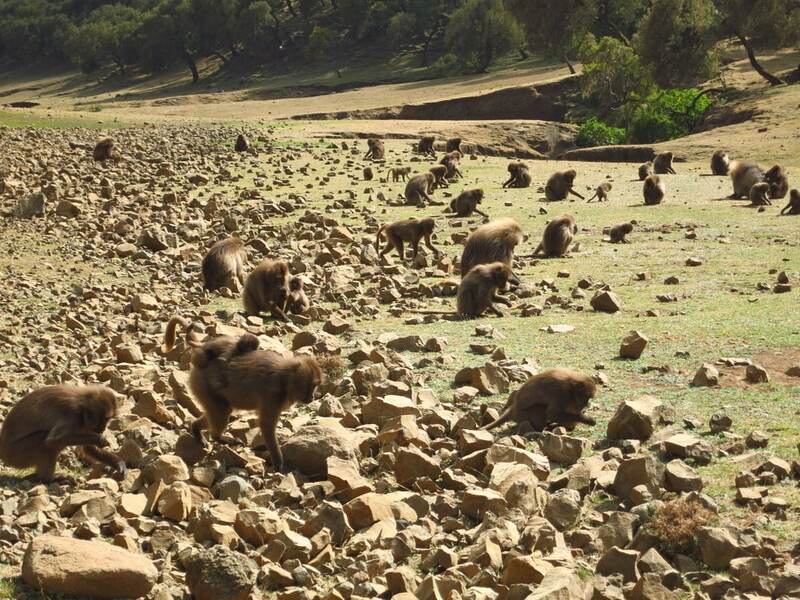 I was thus astonished when our guide took us into a valley, and hundred of wild baboons were roaming around. I don’t think I’ve ever been so close to any group of wild animals. I was surprised at how calm the baboons were. They went about their business, digging roots out of the ground for food, picking ticks out of each other’s skin. Baby baboons were chasing each other up and down cliffs. They were totally oblivious of our existence. If they notice, they absolutely did not care. It was so neat to witness animals in their natural form, not in a zoo or in a domesticated setting. 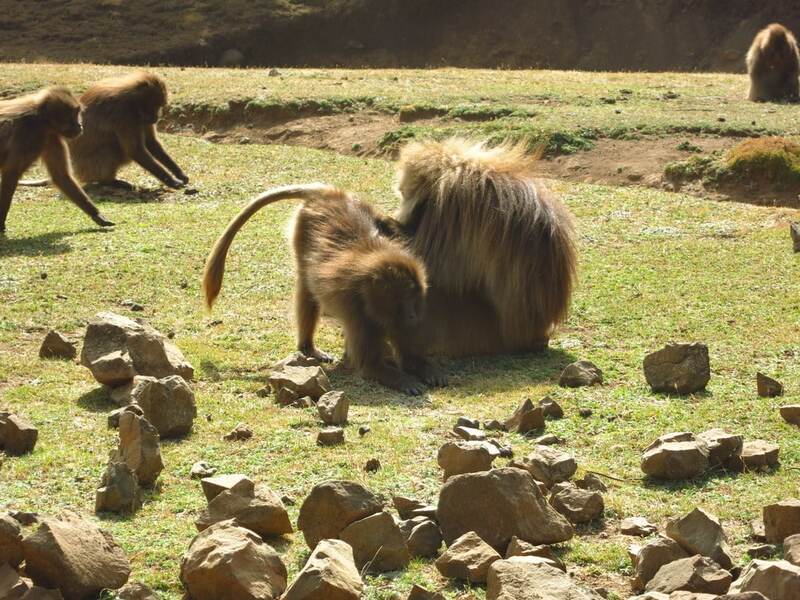 For a few moments, I thought how carefree these baboons live their lives. Humans are simply a different form of these baboons, but how complicated most of us lead our lives. 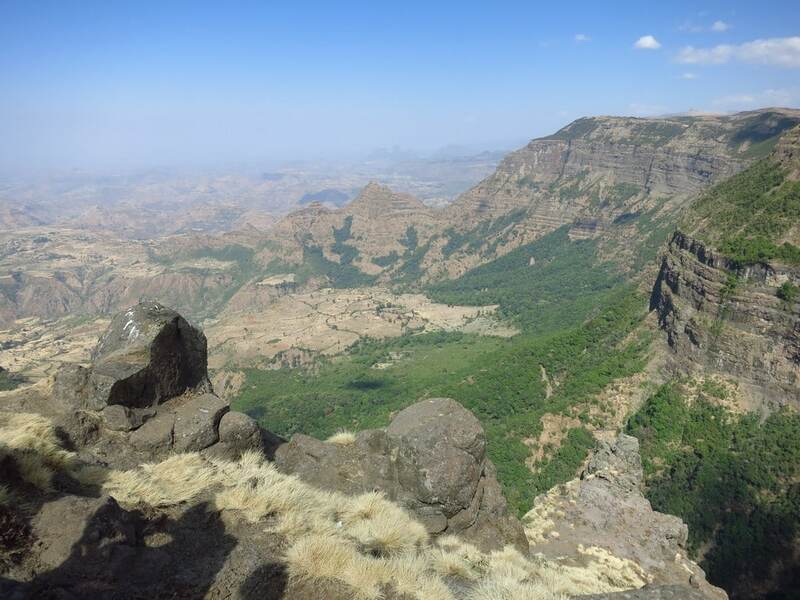 Baboons ended our relatively quick tour of Simien Mountains. 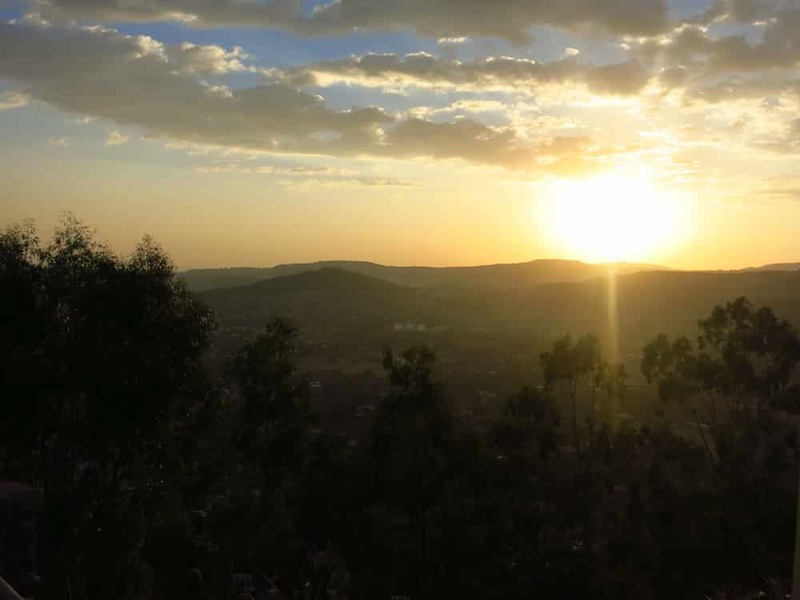 We drove back into town, and stopped at Goha Hotel, situated on a hilltop, for another beautiful sunset.